White House press secretary Sarah Sanders says President Donald Trump is committed to preventing President Nicolas Maduro and his regime from stealing Venezuela’s resources for personal gain. Sanders’ statement comes after the Trump administration sanctioned a major Venezuelan bank and four subsidiary banks. Sanders says Maduro and his regime are using the banks as slush funds to evade United States sanctions and to move money out of Venezuela. The sanctions were announced by the Treasury Department after the arrest Thursday in Caracas of an aide to opposition leader Juan Guaido. The U.S. views Guaido as Venezuela’s interim president. Sanders says the U.S. will continue to take steps to pressure Maduro and his regime until they step out of the way and allow a democratic transition to occur under Guaido. The U.S. Treasury Department says it has sanctioned BANDES, Venezuela’s national development bank, and four additional subsidiaries that BANDES owns or controls. The department says the sanctions are in response to the illegal arrest of Roberto Marrero, chief of staff to opposition leader Juan Guaido. It’s the latest salvo in the battle for power between in Venezuela between President Nicolas Maduro and Guaido. Treasury made the announcement while the president was meeting Friday with leaders from five Caribbean nations. The political and economic crisis in Venezuela tops the agenda of President Donald Trump’s meeting Friday with leaders from the Caribbean, a region that has been far from united in joining the U.S. call for the ouster of President Nicolas Maduro. 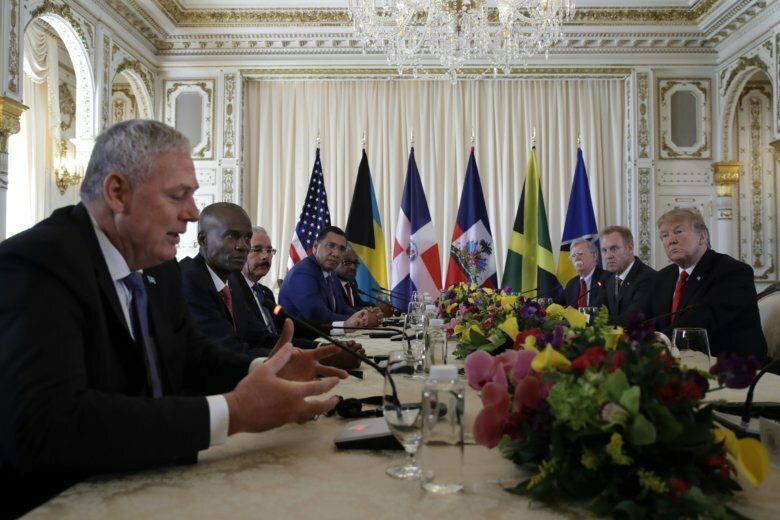 Trump is hosting leaders of Jamaica, Bahamas, Haiti, Dominican Republic and St. Lucia at his affluent Mar-a-Lago club in Palm Beach, Florida to show his support for Caribbean countries that back democratic transition in Venezuela. The five have either denounced Maduro, or have joined more than 50 countries in recognizing Juan Guaido as the interim leader.